For more than three centuries Muslims used the mosque for teaching and learning as well as other activities. 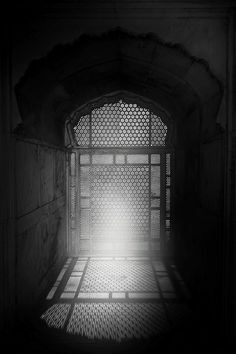 By the tenth century, the teaching activity was extended to the house where the teacher lived gradually introducing, in Persia first, the so called Madrassa. During the eleventh century, under the Seljuk reign, the Madrassa emerged as a separate building, although often adjoining a mosque. The Ottomans inherited this building type with historical records showing that their first madrassa was founded in Iznik in 1331, by Syleyman Pasha. A certain Davud-I- Kayseri became its chief teacher (muderris) with a salary of thirty akce (about $60 today) a day. Later, Bursa and Edirne took over as the main centres of learning respectively. With the arrival of Al-Fatih kulliye, with its sixteen madrassa, a new impetus was given to Ottoman education in Turkey. These schools taught scientific subjects besides theology, transforming the Ottoman madrassa into an institution closely resembling modern university. Generally, there were four types of madrassas reflecting the taught subject (s) and level (s) attained. Regular madrassas were institutions teaching general subjects including religion, science and language. They were equivalent to primary schools and their students achieve a primary level certificate, which enabled them to enter higher madrassas. They were the most spread, found in every corner of the Caliphate. Darulkurra (house of readers) was a high school teaching proficiency in Arabic and reading and reciting Qur’an. The school also trained imams and muezzins. Darulhadis madrassa (the house of Hadith) was specialised in teaching the science of hadith which consisted of the study of the authentic sayings of Prophet Muhammed (Peace be upon Him). Graduates from this school were awarded an equivalent to a university level, enabling them to work as Friday lecturers, judges and so on. The Medical madrassa did not appear until the sixteenth century during the reign of Suleyman the magnificent. Prior to that medical teaching was carried in hospitals as was the tradition. 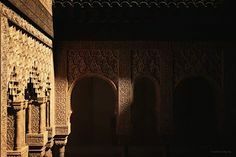 The madrassa was, usually, founded and maintained by the sultan, princes and other nobles as well as the Wakf, who could afford to meet the expenses needed for free education to students. The Madrassa continued to be one of the main venues of education in the Muslim World under the Ottoman Caliphate until 1924 when Ataturks’ law of 16 March 1924 abolished it in favour of modern schools and universities. In planning terms early Ottoman madrassa maintained the spatial configuration developed under the Seljuks in Anatulia, which was based on the iwan plan. Such plan consisted of a courtyard towards which the iwans were opened. This was the norm in Anatulia and in most of the Muslim East, especially Persia. 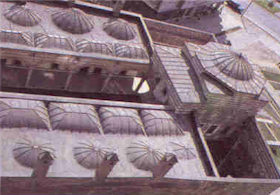 By the thirteenth century, a shift towards the enclosed iwan plan emerged first in Karatay Madrassa (Konya, 1251-52) where a central dome pierced with a number of windows replaced the old open courtyard. The iwans, which were used as classrooms, were opened into the central space created by the huge dome. Such features influenced without a doubt the development of the architecture of Ottoman mosques, especially in early years when the spread of enclosed mosques covered with one huge central dome as seen above. The Ottomans, at first continued to employ the enclosed iwan plan. The Haci Hali Pasha Madrassa (Gumus, 1415) the Seljuk four iwan mosque arranged around a square court covered with a large dome. Later, however, they returned to the open courtyard iwan scheme, probably because of the nature of its function as a centre of learning frequented by so many students who needed a secure open space for recreation. This is seen in Cacabey at Kirsehir, built in 1272, which closely resembled Karatay with cells (iwans) arranged around a domed central space with an ablution fountain. However, here the central space was opened to the sky. 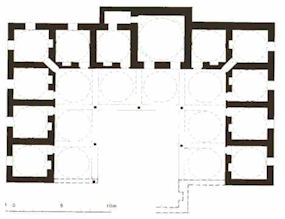 This progressively led to the adoption of simpler plan version, mostly rectangular or square, consisting mainly of cells of classrooms opened into a central courtyard. Suleyman Pasha Madrassa (Iznik, 1330) is considered as the embryo of the three sided plan (U plan) which consisted of four cells arranged along three sides of the open courtyard only, while the fourth side was left empty. 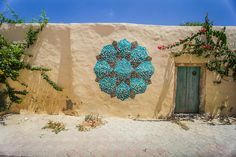 Another feature appeared in this madrassa was a domed room, distinguished from the other cells by its large size and projection behind the building, known as dershane which was used as the main classroom. This three sided plan was later refined and developed in subsequent Madrassas, especially since the fifteenth century. The dershane occupied the fourth wing while the other three accommodated students cells. Since then, most of the Ottoman madrassas adopted the single classroom U plan scheme. Madrassas of this typical plan include madrassa of Mehmed Afendi, Istanbul and Bayzit II, madrassa in Edirne. In these madrassas the cells, and arcades, were covered with domes and furnished with windows and a chimney for use in winter. A number of common toilets and bathrooms as well as central fountain provided adequate personal facilities for students. The exterior of the madrassa is usually blind and simple, but interior walls are beautifully decorated with tiles, bricks, and stalactite (muqarnas). There is a slight confusion about the number of schools Al-Fatih built with his kulleye. Kuran, A. (1968), op., cit., p.21 refers to sixteen, but Ahubay Zeynep (2000), ‘Ottoman Medreses’, Halil Inalcik et.al. (eds. ), The Great Ottoman, Turkish Civilisation, Semih Ofset, Yeni, Turkiye, p.340, mentioned only six. Ahubay Zeynep (2000), op., cit., p.338. The Kapiagasi Madrassa at Amasya had an octagonal plan. 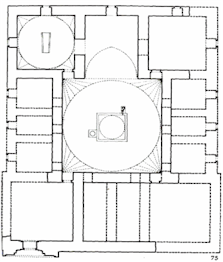 Later Sinan re-used this plan in the Madrassa of Rustum Pasha in Istanbul. 6 There are instances where more than one class room was used as in Mehmet Celebi Madrassa at Merzifon (1414-18) which had two classrooms, and Yildirim Madrassa in Bursa had three rooms. For more see Ahubay Zeynep (2000), op., cit., p.343. Figure 1 – Source: Kuran, A. (1968), ‘the Mosque in Early Ottoman Architecture’, University of Chicago Press, p. 77. Figure 2 – Source: Goodwin Godfrey (1971), ‘A History of Ottoman Architecture’, Thames and Hudson., p. 39. Figure 3 – Source: Ahubay Zeynep (2000), ‘Ottoman Medreses’, Halil Inalcik et.al. (eds. ), The Great Ottoman, turkish Civilisation, Semih Ofset, Yeni, Turkiye, p.341.